Thirty two into sixteen into eight into four into two into one, synthesis was combination and reduction of multiple things into one result. It allowed for a neat funneling of data and matched Jolyne Atreides’ magic perfectly. Genetics had always fascinated her and today she was going to be creating new strains of plants bred from other plants, beyond that she would also have to journey to her ancestral homeland before this was through. The idea may upset her a tad, but the fact that her genetics would align with the plants in such a way must be a good omen in her eyes. While not specifically religious, the Atreides were a superstitious tribe who kept ritual passed via the tongue from a far distant generation. This allowed Joylne to find relief in what she was doing and setting about, and knowing that her spells could help others was simply the equivalence of “icing off the cake” as they called it in Fiore if she remembered correctly. The day was a good day to be inside as the wind howled outside, Jolyne had found herself in the basement of a family sympathetic to the Rune Knight’s cause and this would be the base of operations for her growth here. While Jolyne had already gathered the spice, we will later go on in length in how she acquired them later, for now it is needed to note that it was before her joining the Magic Order she was currently in. She would also be breeding quick growing vines for entrapment and a type of healing bean, hopefully she could find a way to increase the intensity of the latter so she would not have to breed entirely new species of plant as her magic power increased. That would be a pain after all. Pain did bring growth, but the less pain she had here the more tolerance she could reserve for the pursuit of new knowledge for spells to add to her mental grimoire. 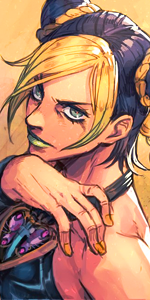 Pain would one day be the key to unlocking genetic knowledge no doubt and that was the ultimate pursuit of Jolyne. Unlocking the memories of the dead so she could see her parents’ killer. No doubt it was a selfish pursuit, but pain demanded soothing in the mind of Jolyne and her form of Justice allowed for such ideals as revenge. For now however, she would be growing some plants and beginning to lay the bricks to her own road of success. A golden path lay ahead her and while she could not yet see the completion of it, soon she felt as though it would be revealed to her. Complex machinations whirred just out of the grasps of her consciousness, only to be held when the time was right. Looking at the seeds below Jolyne believed that she may be able to control the output of the chemical and thus the ability to control the concentration of the chemical and healing resulting from consumption, this pleased her. The sterile environment she had set up did not extend to the whole basement but instead covered half, allowing her space enough for a table and not much storage. The storage that was there was an odd contraption that appeared as though it could easily be folded inward for a less bulky transportation. It held four drawers and two were filled with what would look like sand to anyone else, the other two were filled with some of the seeds similar to what she currently had on the table and their genetic ancestors which had mixed their chemicals to allow for an extremely rapid healing process to be allowed. Now these beans truly were a magical fruit. Each plant was a new life that was brought forth from the fruits of it’s ancestors and Jolyne would often apply that philosophical line of thinking to humans and how they were products of what surrounded and came before them. The greatest seed could fail in a bad enough environment, and so too then could the greatest human. Due to this one must never be to hard on someone, but she could not help from being hard on herself. Especially when, as today, she lost tract of one of her seeds. Frantically searching around the sanctioned off area and going through her belongings, it took her a bit of time before she found the seed that would begin her strains of Senzu beans. The bean itself would have healing properties while the roots and stem of the plant would retain the regular structure from it’s ancestral bean plant. The soil was soon craddling the seed in an earthy womb where it would grow over the next couple of hours, for most plants this could be days, weeks, months or even years but thanks to Jolyne’s magic her plants grew like supercharged weeds. Still they required the fuel needed to grow and the environment that was suited to their needs. Thus Jolyne induced moisture into the basement for the duration of this experiment, she also kept the lighting high. While she did not have access to magic herself, she did have access to mirrors and as such even on a snowy day like today she would still have the light required to grow a plant. This part was as sacred as any ritual her people had taught her. This part was what was most enjoyable to her. This was the part that would make or break the experiment. Taking one of the buckets she had placed down there Jolyne carefully added water to the pot and within seconds a tiny green leaf began to sprout from the deep brown soil. The soil itself was soft and full of the needed ingredients for growth but would dry out within six hours no matter how much water was pumped in, a dangerous side effect of her magic. The water soaked had soaked into the soil and even now the color of it was beginning to become more light. This was why Jolyne did not simply grow her plants outside, she could not be sure of the abuse of the outside ground and did not wish to risk creating another desert on this continent. The results could be quite catastrophic if her negligence combined with others. Of course with the regulations set in place by the Laws of the Lands, the Atreides figured this would not occur, especially if she set the example herself by being safe in the first place. The beans would not begin to grow for another thirty minutes, for now as the important stage was complete, Jolyne could step outside for her addiction. Ascending the stairs of the basement she arrived on the main floor and made sure to thank the elderly couple for their space for the twelfth time and despite their protests. After this she was on the porch dressed in her regular attire in her continuing attempts to acclimate herself to her new climate. Her clothes were colored in differing shades of blue and grey and was cut mainly for her enjoyment of the feeling of air on her skin thanks to growing up in desert robes, an unintended byproduct of this was revealing her less than lady-like figure which garnered both positive and negative comments. Still her cardio had gone to crap ever since becoming addicted to the calming effect of these cancer sticks. Removing one from her pants pocket she light it while staring off across the landscape. It was difficult to think that soon a Demonic Rift could open here and destroy the natural beauty of this place, it did not seem fair to Jolyne and was one of her reasons for joining the Rune Knights in the first place. The ash forming from her consumption of the tobacco represented her past in Jolyne’s mind, something that can still be grasped and seen but something that could no longer be smoked or lived. From there it was easier for her to not allow the past to cling to her like some heavy set of chains, binding her from moving forward in her life. Sighing she smiled, the cigarette had calmed her and prevented negative thoughts about her parents deaths to build up within like some acidic teapot. Now she could focus once more upon her work. 1408/2000 for C Rank Spell. Upon arriving back inside the house Jolyne thanked the elderly couple for the thirteenth time, and they once again patiently rebuked her. Downstairs a surprise was awaiting Jolyne, while they were not big, the beans had already grown on the vines of the stalk. A pleasant shock to be sure as it was in under half the time she was expecting based upon her previous experiments, perhaps the seeds were becoming more genetically adapted to her magic allowing for a further rapidization of growth. This was something fascinating that she simply had to chart down in her notebook she kept between her shoulder blades, reaching her left hand above and behind her head she slid the notebook up and out while grabbing a pen with her right and flipping open to the current day. Today the beans began to grow in approximately .041823333 the time expected based upon experiments 0001 through 0203, this is also the first synthesized seed experimented on. Thus in this researchers opinion, the leading hypothesis is that synthesized seeds are better suited as conduits for mine own magic. Replacing the notebook to where it belonged Jolyne shifted her attention back upon the plant in question. She was proud of the little thing, not as proud as a mother would be but quite proud none-the-less. She almost felt like rewarding the thing before remembering that a plant would not notice a reward, let alone connect such a thing to an action that it took. Furthermore it was not an action of it’s own make unless an experiment never again grew fast, which while possible was improbable almost to the point of impossibility. Jolyne’s magic was that mathematical and scientific luckily enough for her and her penchant for recording things in a sterile manner. In the end the Senzu bean was ready to be harvested after two and a half hours of growth in the pot, the soil of which would be held and then discarded into a source of flame, turned to glass to ensure the cursed dirt never mix with nature. Jolyne gathered the material first and then set about taking down her laboratory, the process took another half hour and by the time she said her farewells to the couple the sun was already beginning to set and sending purple and orange hues flaring across the sky. The birds were chirping their sleepytime calls as Jolyne called it, and the scent of humanity was not much in the outskirts where the couple dwelled and the ruinistic nature of this place was what drew the Atreides in the first place. Setting out on her path however she soon encountered something that would test her experiment much sooner than she had thought however. A man was laying on the side of the road, yet did not call out to her. ‘Is he mute or did he injure his head’ Jolyne hurried worried to herself as her long legs began to pick up stride to get closer to the man. “Are you okay?” she asked her tones sweet as honey but filled entirely with concern as her green eyes began to dart about the man and noticed the blood on his left leg, from there it was only a matter of miliseconds before she saw the bone poking out from it. Immediately she shoved the newly grown bean into the man’s mouth and he swallowed wordlessly as the leg repaired itself.